So a few blogs back I wrote a bit about the whole Geronimo/Skull and Bones deal. Little has happened since in that particular case and, frankly, I am not sure if anything interesting will happen. However, the whole Christie’s sale drama over an apparently *different* set of skull and bones from Skull and Bones is something that has, at the very least, sucked up a few moments of this lazy day. Quick story: the skull and bones is human, was made into a ballot box (hinged skull cap people, hinged skull cap), and was being sold with a book of names from the mid 1800s…which of course is meant to make you feel like the skull is from that time period. True to deceptive form, the auction house said the lot was being sold by “a European art collector.” Now the skull and bones has been pulled from the auction due to “a title claim.” And there you go. Now you and I both know that auction houses cannot be trusted. Sorry auction houses, you guys just lie. About a year ago I gave a paper at a conference that was written up in a pop science magazine. The paper concerned the research from my masters which primarily looked at the money made at Sotheby’s on South American antiquities auctions. The magazine rightly allowed Sotheby’s to comment and the auction house pretty much said that they dispute everything. I got those numbers out of your auction catalogs…and made them into charts! It was really, really straightforward and easy, how can they dispute what they published? Because they lie. Coming back to the issue of the Skull and Bones skull and bones, I can’t help speculating about what really happened. Frankly, it is Christie’s own fault that I don’t believe them. 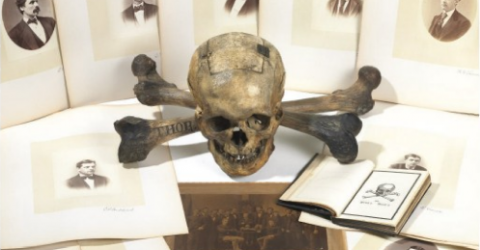 What the auction house means to imply by what they have said is that some anonymous European put the lot up for sale and then the real Skull and Bones have stepped forward, claiming the object as theirs…saying it was taken without their permission in the past. Christie’s, OF COURSE, is happy to hear claims on stolen materials and halted the sale. Plus we all know that members of Skull and Bones butter Christie’s bread, right? Maybe. But first you would think the bread butterees would have asked the bread butterers if the consignment was kosher before printing that expensive catalog. Second, barring the first, auction houses don’t usually balk at obviously illegal sales. The FBI can be on the doorstep saying “don’t sell this” and the house goes through with it anyway. Third, anything being sold by an anonymous European of any sort is suspect. Anonymous selling means something is being covered up…and more often than not the anonymous collector doesn’t exist. So what gives? Who is selling the thing? Why was it pulled? Curse you auction house, curse your deceptiveness! Oddly enough this post was supposed to be a discussion on the sale of human bones. Perhaps we shall cover that in our next installment. ← Everest: Good for the Sherpa? Good for my PhD?